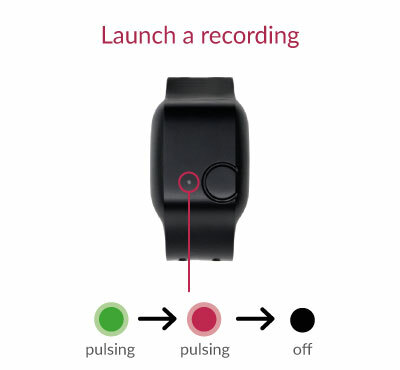 Using the E4 in recording mode allows you to record the data in its flash memory. While the E4 is in recording mode, up to 60 hours of data can be stored in the device's flash memory. Data remains on the device until a USB connection is made to a Mac or Windows PC running E4 manager Software. E4 manager transfers recorded sessions to your PC’s storage, clears the E4’s memory and syncs the clock. If an internet connection is present it also uploads session data to E4 connect servers for processing, visualization, and retrieval. Power ON the E4 when the device is powered off a 2-sec button press will power it on. The LED light will flash green. Wait for the recording to begin the LED indicator light will flash green for 60 seconds, then flash red indicating that the recording has started, and finally go dark to save power. Tag an event tap the button (< 1 sec) while streaming to tag an event. 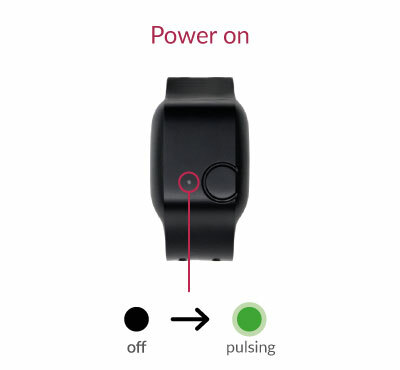 You will see the LED indicator turn red for one second than turn black again. REMINDER Be careful to click and release the button quickly when tagging an event to avoid powering down and / or resetting the device. End session a 2-sec button press powers the E4 off ending the recording and marking an end of the session-file for the data record. When you end the session the LED light will pulse red for one second before powering off. TIP Learn more about how to download and analyze your data after the recording.